Corby Town have boosted their attacking options with the arrival of striker Shaquille Leachman-Whittingham. Leachman-Whittingham is set to make his debut when the Steelmen take on second-placed Buxton in the Evo-Stik Northern Premier League Premier Division at Steel Park on Saturday. The frontman started his career at Walsall and went on to have a spell at Tividale before joining Market Drayton Town at the start of this season. Now he has joined the Steelmen who will be hoping he can get them on the goal trail with the team registering just one goal in their seven matches so far this season. 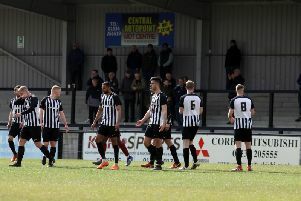 Corby boss Tommy Wright said: “I’m delighted to bring in a striker, who can also operate as a wide player. “He’s very much in the mould of Femi Orenuga, a skilful and quick player who can provide us that spark in the final third.